Here in the USA the natives are restless in schools across the nation as they wrap up their studies this month and anticipate a lengthy summer break from the monotony of classroom routine. How we define ‘school’ and ‘education’ is no small thing because our beliefs will determine a heck of a lot about our lives, our children’s lives and our future, separately and together. Most of us, understandably, have a conventional view of schooling. We’ve watched it modeled, we’ve lived it for decades, thus we became it. It simply is. Typically children go by big yellow bus or carpool to institutional settings where they sit in desks in classrooms with peers, line up to go to the bathroom, water fountain, lunch room, and playground then line up to go back to desks for hours and hours with a few variables. Then these kids go home to do homework, play on the computer, maybe play outside if there’s time, sleep and wake up the next day and do it all over again with the occasional holiday, sick day or field trip thrown into the mix. This was my experience while growing up minus the computer while adding significant time playing outdoors, riding bikes, climbing trees, exploring the neighborhood – because that’s what we did every single day for hours after school, being unencumbered by the copious amounts of homework required of kids these days. When I had children, I used to believe they were empty buckets needing to be filled with all the necessary information and knowledge determined by an unidentified expert somewhere. As I endeavored to home educate my sons (another story for another time) I nervously eyeballed the ‘scope and sequence’ timelines I would come across, fearing I’d miss a major building block in their education, thus crippling them for life. I’ve come to understand that children are born brilliant and educating a child is simply tapping into the genius already there by nurturing it with the necessary components for growth. God fills in the gaps of the ‘scope and sequence’ organically as we do our part to attend to our little human; loving, training and providing nourishment. It’s as if mind-blowing seeds of GENIUS are locked within every single child and it’s up to us to unlock that ‘seed-potential’ lying dormant in that kid by providing the necessary components for this ‘human plant’ to thrive, not unlike gardening. 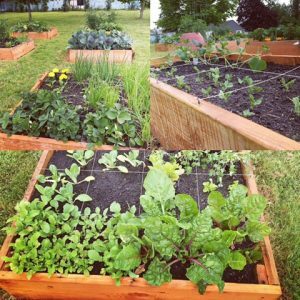 Whether it be tomatoes, marigolds, cucumbers or melons we’re tending to out in the backyard, the principles remain the same. When we nurture these seedlings in healthy, rich soil, with fresh air, fertilizer, water, protection from the elements and destructive enemies in their many forms, while providing appropriately-measured boundaries so as to avoid root bound conditions, or watering carefully to avoid root rot, we will be amazed and even ecstatic to see the hearty, miraculous fruit that emerges from our humble efforts. Children are exactly the same. As I spend time with my grandchildren, these principles are underscored and highlighted for I feel as though I’m homeschooling all over again, just engaging with them, because learning comes so naturally to children. Their hunger for knowledge and understanding – to know what, why, how, where and when – is so God-given that if our radar is on we will see that real, valuable education is happening constantly, even on summer ‘break’ when you think they’re simply playing. 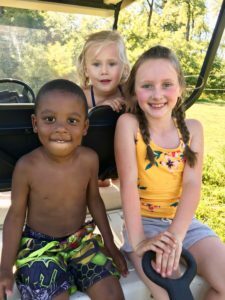 As I interacted with my grandchildren this week, we participated, unintentionally in so much learning – we sang songs, built Legos, named our letters and counted while we played on the swings, colored and drew, investigated the horses next door, the airplanes in the sky, the irritating crows and seagulls. 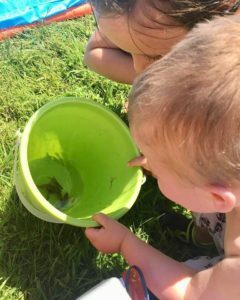 …caught a frog then gently led him back to freedom. Suddenly she was inspired to create some fresh-squeezed juice drinks for her parents, decorated with fresh fruit. She interjected little bits of wisdom along the way about how we should train the puppy and what little sister can or cannot do. We prayed, we talked about creation, and we snuggled. Perhaps I’m stating the obvious, but this holistic approach to life IS AN AMAZING EDUCATION and develops the entire person: mind, body and spirit setting their wet cement according to our values. 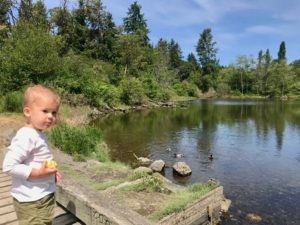 I’m excited to be able to participate in the informal education of my grands a lot this summer (click here to read my recent post), and I can only imagine what we shall discover together even as their intellect is stirred and our bond is deepened – what a privilege to be available for them in this season. My heart beats to see all of our children and grandchildren unchained from the stifling menu of staid, conventional order as they learn. I believe the classroom should consist of wide open spaces where they are encouraged to find their unique expression within the freeing parameters of their parents values -this is a curriculum that never fails in its effectiveness. Let’s make every effort to help them grow organically this summer, running toward their destiny! 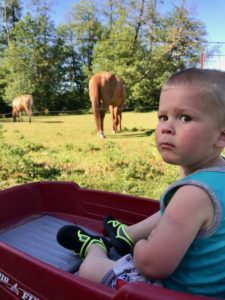 Ponder for a moment how you have defined ‘education’ and ‘schooling.’ After reading this post, are there some tweaks you’d like to make in your definition and approach with the children in your life? Jot down those thots quickly so as to capture them while they’re highlighted in your mind. Be prepared for all the kids in your life to suggest you ‘watch a movie together, play with Snapchat, look at videos and pics on your phone, play a computer or digital game’, because they will! And be prepared to cheerfully offer a better alternative! Make every effort to keep electronic amusements to a minimum so that your time together is maximized to be meaningful even if it’s simply working together in the kitchen. It’s real life and real life MATTERS! Be determined to ignore your smartphone and laptop as much as is humanly possible. Yes I snap pics and vids when I’m with my children and grandchildren, but most of the time we’re together, I work to keep my phone silenced and out of sight. Most of us are addicted to our devices in some way, and we must recognize the need for change. Thank you for reading, I’m truly honored. 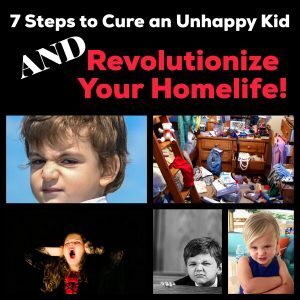 If you’d like to read more, subscribe for my updates and grab my TRANSFORMATIVE spring freebie, 7 Steps to Cure an Unhappy Kid and Revolutionize Your Home Life by clicking HERE.